Ee Lian and Heng Kiat were my former colleagues during the time when I was freelancing in a small company in Seremban. Back then they hardly knew each other, both being fresh out of school and had just joined the workforce. 12 years down the road and come December 12 … it’s their wedding day! I was so surprised by the news when I bumped into them over the weekend at Subang Parade while they were window-shopping at a goldsmith shop. Immediately I thought they were still hunting for their wedding band but I was embarrassingly wrong! Since they had recently legalised their marriage at the Registrar of Marriages, they were already proudly wearing their titanium rings! Titaniam rings? Hey, why not gold? ‘Tis definitely something new to me … I’m so old-school … duh!!! According to Ee Lian, they didn’t want the classic gold bands and opted for titanium jewelry instead which looked modern and a lot more elegant. Moreover, titanium is known to be extremely strong and durable. 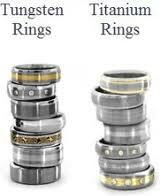 These days, titanium jewelry are very fashionable and fast gaining popularity. They both wore identical gold-inlayed black titanium rings while Ee Lian kept her engagement ring on too. Heng Kiat had gotten her a custom-made tungsten ring with cubic zirconia stones when he proposed to her on Valentine’s Day last year. Wow!! How romantic! It's 2010 this year and gold wedding bands are considered old-fashioned. So assuming when my son, Nick gets married in 12 years’ time … are titanium or tungsten rings going to be things of the past too by then! Yup, titanium rings are the trend now. Hmm..I think in 12 years time, rings will be history wor.... maybe micro-chips implant into the fingers...whereby you have your spouse's name and details implanted underneath the skin - no way to run wor.... - to prevent divorce! hehehe! Yeah, they should invent those micro-chip to be organic ... able to absorb each other's traits and habits ... then each couple will definitely be made for one another ... zero divorces ... hehehe!